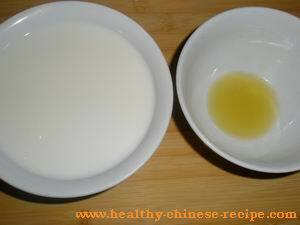 Ginger milk curd or ginger milk pudding is a popular Chinese dessert in Guangzhou area. It helps to prevent cough and keep Yin-Yang balance in summer. This dish was from a story. An old lady got cough. She was told that ginger juice can cure her cough. But ginger juice was too spicy for her. Her daughter-in-law spilt some milk in the ginger juice by accident. The milk and the juice became solid short time later. The old lady ate and felt that it's fresh, smooth, and fragrance. On the second day her cough was cured. This tasty and medicinal dessert then become popular. It's hot in summer. Yang Qi comes to the body surface. Yin Qi resides in our body. Meanwhile we consume much cold drinks. All these make our stomach and other organs very cold. In autumn and winter it's easy to cause cough or lead to other disease. Ginger has warm energy. It can remove coldness. But ginger itself is spicy and easy to cause heat. So Ginger Milk Curd is a good choice. 1. Making ginger juice by squeezer. 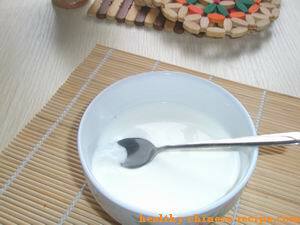 Put 1 teaspoon into a bowl. 2. Add sugar in the milk. Heat in low heat till almost boiled. 3. Turn off heat. Cool till about 70-80 Centigrade(158-176F). 4. Pour milk into the ginger juice. Stir several times. Cool in a fridge in summer. 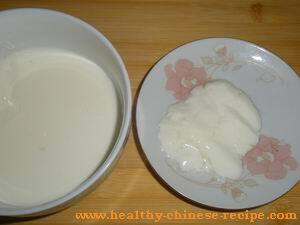 10 to 15 minutes later, the milk will become jam-like solid milk block, very smooth and tender,like very soft tofu. Serve. 1. It's the protein that makes the milk to become solid. So the higher the milk contains the protein, the better the ginger milk dessert. 2. Only after practiced several time later, did I manage to make this dessert successfully. So don't be discouraged if it doesn't become solid for the first several times.